Trump relished bantering and praising the law enforcement officials. During his visit, there was not any mention of the debate over gun regulation set off by the shooting. Trump’s visit followed a similar script to his trip to Las Vegas in the fall. 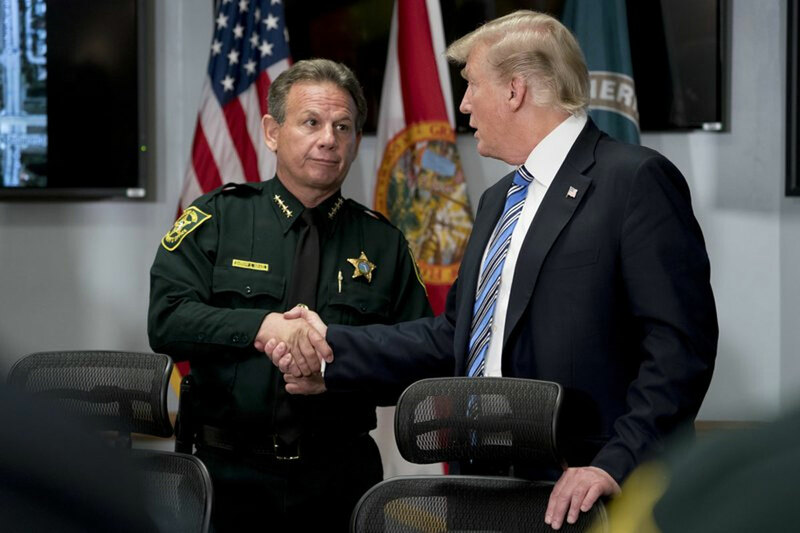 Trump relished bantering and praising the law enforcement officials, he marveled at the speed with which first responders rushed the wounded to the hospital and he extended hearty thanks to first responders. But the president who has never been a natural at consolation didn’t publicly address the grief and sorrow gripping a shocked community and nation, beyond his mention of how sad it was to meet with victims. Late Friday, he tweeted about the school shooting: “Our entire Nation, w/one heavy heart, continues to pray for the victims & their families in Parkland, FL. To teachers, law enforcement, first responders & medical professionals who responded so bravely in the face of danger: We THANK YOU for your courage!” He included pictures of an injured young girl and her family that he and the first lady visited. During his visit, there was not any mention of the debate over gun regulation set off by the shooting. The president ignored a shouted question about whether guns should be more tightly regulated.